The Last Leaf Gardener: Two Celebrations! The 2nd Sunday of Advent AND National Cookie Day! Two Celebrations! The 2nd Sunday of Advent AND National Cookie Day! 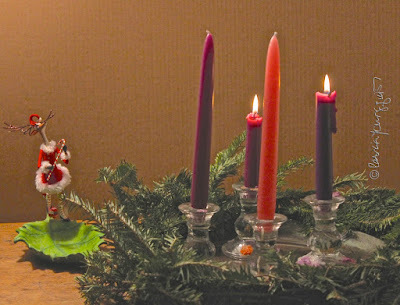 Today is The Second Sunday of Advent! Last Sunday, November the 27th 2016, which was The First Sunday of Advent, began the new liturgical year with The Season of Advent. I wrote about this fact in a blog post and mentioned that, "according to Holiday Insights: 'Advent is a holy season in the Christian calendar. It is the beginning of the liturgical calendar. It is a very special time, as Christians wait and prepare for the coming of the Lord, Jesus whose birth we celebrate on Christmas. While Santa Claus' arrival is a big big event, we must remember Jesus' birth on earth is much bigger, and the real cause for Christmas. In the early days of the church, Advent was a time of prayer and confession. Today, Advent is more a time of preparation and expectation of the coming of the Lord. 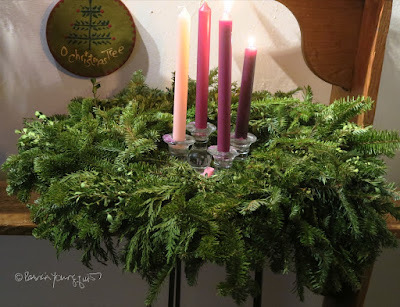 "'The Advent Wreath is an important symbol of Advent of the season. It usually sits on the dinner table and is a constant reminder of the holy season. The wreath is of German origin and consists for an evergreen wreath, and four Advent candles. Three candles are purple and one is pink. "'The lighting tradition- On the fourth Sunday before Christmas (the first Sunday of Advent), the first Advent candle is lit at dinner and a short prayer is said. The first candle is lit each night along with a short prayer. 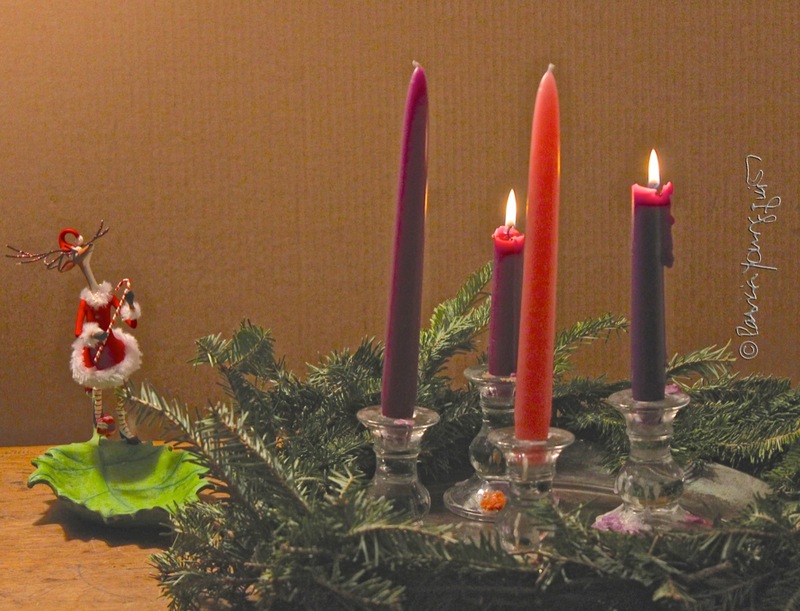 On the second Sunday of Advent, a second purple candle is lit. On the third Sunday the pink candle is lit. 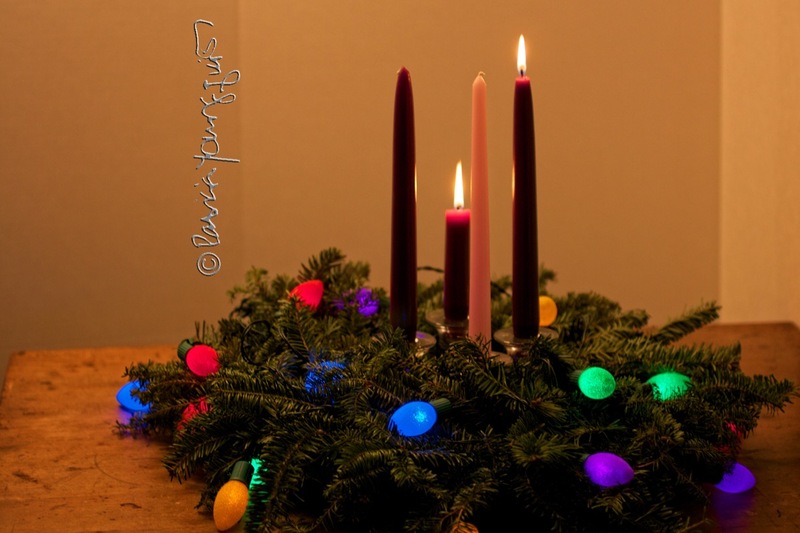 Finally on the fourth Sunday of Advent, just a few days before the birth of Christ, the final purple candle is lit." The first two images atop this blog entry feature my Advent wreath as it appeared on the Second Sunday in Advent during bygone years, while the third picture features how it appeared on the vigil (eve) of this year's Second Sunday in Advent. Btw, Holiday Insights also states that 'The Advent wreath is made up of two basic parts: the wreath itself and the candles. The wreath is made of evergreen, either real or artificial. 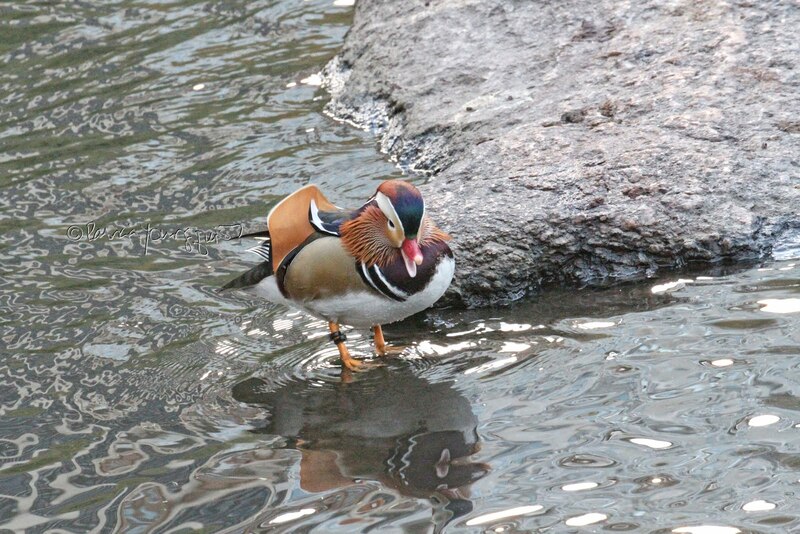 It s circular shape represents eternity, for it has no beginning and no end. The evergreen was chosen as it symbolizes growth and everlasting life. There are four candles, three purple and one pink. They represent the four weeks of preparation. As another candle is it each week, we are reminded of the growing light of Christ's presence. "'The meaning of the candles is as follows: First Purple candle: represents hope. Second Purple Candle: stands for love. Third, pink candle: represents joy. Fourth purple candle: is a symbol of peace.'" This particular Second Sunday in Advent, because it falls on December 4th, coincides with a secular "observance," which is a Christmas related holiday known as National Cookie Day. According to National Day Calendars, "National Cookie Day is observed annually on December 4th. 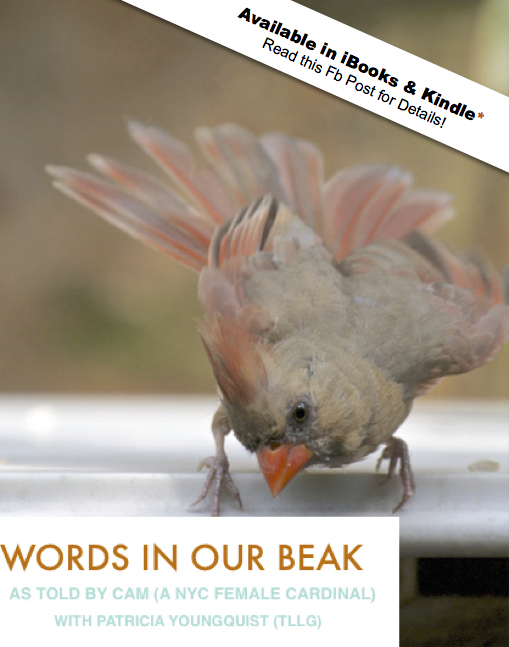 (And) We can thank the Dutch for more than windmills and tulips. The English word “cookie” is derived from the Dutch word “koekie” meaning little cake. There have been cookie-like hard wafers in existence for as long as baking has been documented. This is because they traveled well however, they were usually not sweet enough to be considered cookies by modern day standards. The origin of the cookie appears to begin in Persia in the 7th century, soon after the use of sugar became common in the region. They were then spread to Europe through the Muslim conquest of Spain. Cookies were common in all levels of society throughout Europe by the 14th century, from the royal cuisine to the street vendors. Cookies arrived in America in the 17th century. Macaroons and gingerbread cookies were among the popular early American cookies. In most English-speaking countries outside of North America, the most common word for cookie is biscuit. In some regions, both terms, cookies and biscuits are used." 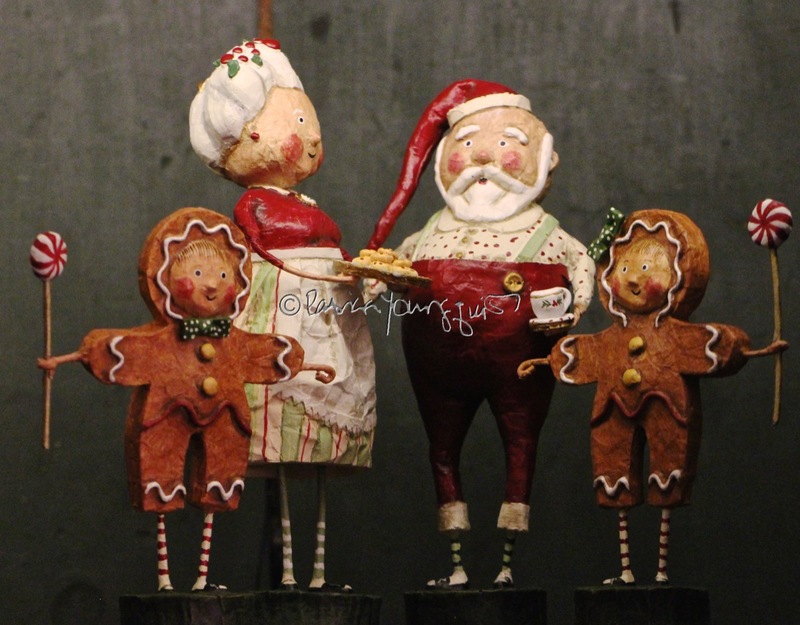 I think of National Cookie Day as a Christmas-related holiday because a number of folks bake cookies for the Christmas season, including Mrs. Claus, who is currently one of the returning characters (figurines) visiting my home for the pre-Christmas season! 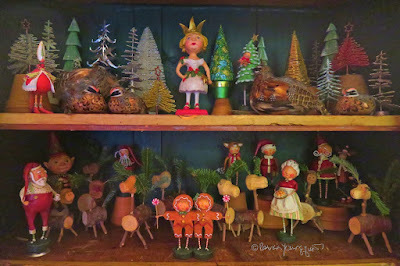 She can be seen amongst my holiday visitors (figurines) in the following photograph. You will find her in the lower right-hand corner of this image, where she is standing directly above my signature. 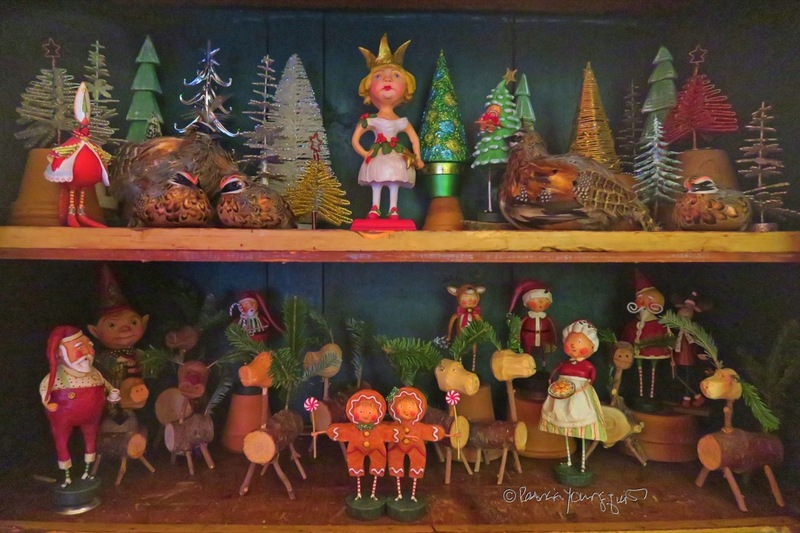 And you may even recognize her, as she has been featured in posts within my cyber-venues, including one on hometalk (HT) in 2013, which discussed how Mrs. Claus was moved by then President Obama pardoning a turkey named Popcorn, thus saving the turkey from being someone's Thanksgiving dinner! 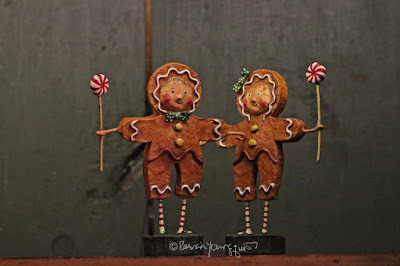 In the aforementioned entry, I stated that I had "an interesting story to share about the fraternal gingerbread twins who are among the guests that are visiting me." Btw, these twins can be seen holding hands in the image directly above. 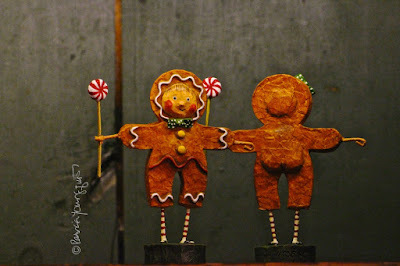 In any event, within the particular 2013 HT entry that I'm referring to, I wrote that "the gingerbread twins are especially grateful to report that they have something in common with a turkey named Popcorn. Popcorn is the twenty week old turkey that president Obama pardoned on November 27th 2013. As you may know, one of the powers the president of the United States has includes an annual ritual of pardoning a turkey at Thanksgiving, which allows the turkey to become a free agent instead of being a dinner for someone. According to USA Today, when the president pardoned Popcorn, he stated, 'Popcorn, you have a full reprieve from cranberry sauce and stuffing. We wish you well.'" 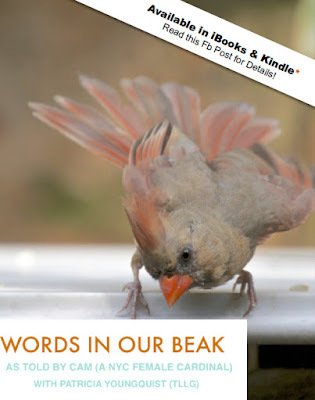 And also within that same HT entry, I confessed that "when I showed Mrs. Claus USA Today's article, she was especially moved when she read that 'Abraham Lincoln is said to have saved the life of a dinner-bound fowl that his son had taken a shine to." I also stated that "Mrs. Claus was so moved by Popcorn's news, that she decided to pardon the gingerbread twins. Instead of baking them so that Mr. Claus could dunk them in his hot chocolate, she gave them peppermints to celebrate their freedom, which they were delighted to do." This is evidenced in the following photos that are similar to ones used in that post. Moreover, at that time I shared that "Mr. Claus didn't mind that Mrs. Claus spared the twins' lives as long as he could still put a nip of bourbon in his hot chocolate," and I featured them all together in a photograph very similar to the one directly below. 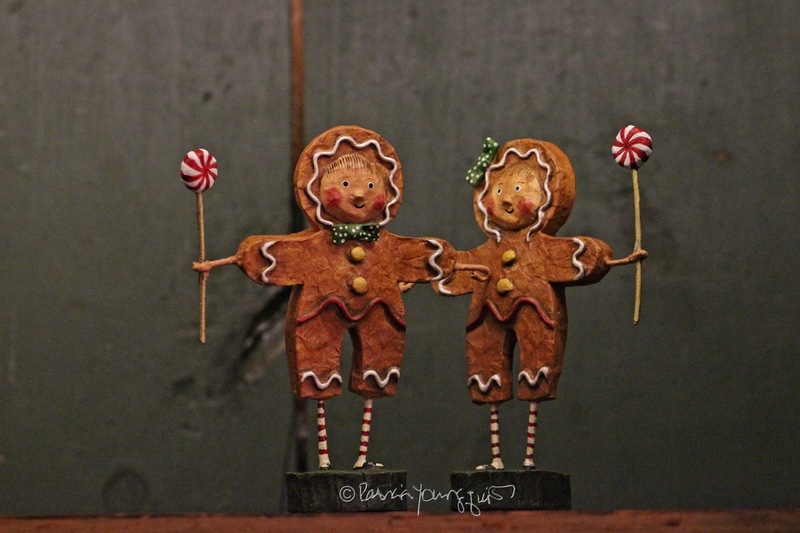 Be that as it may, Mrs. Claus's act of pardoning the gingerbread twins was nearly three years ago; and she, as well as Mr. Claus, continue to delight in these "cookies" presence! 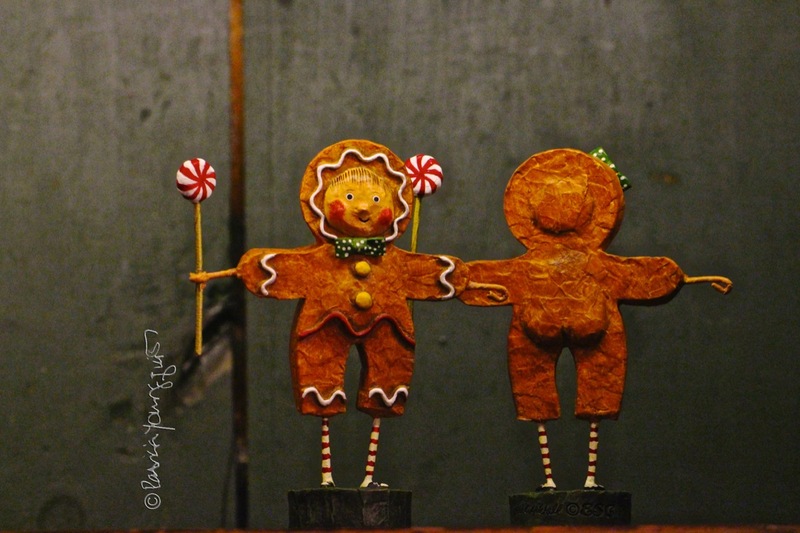 They are grateful to be together on this National Cookie Day! 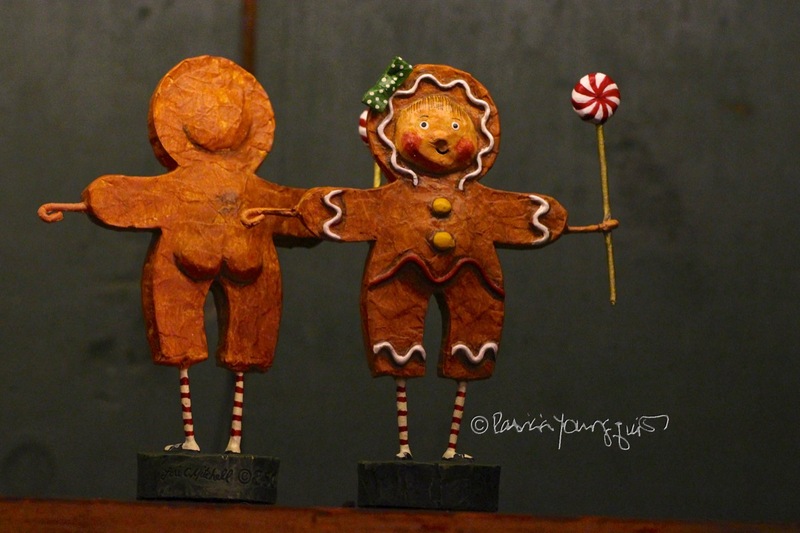 Btw, the gingerbread twins, as well as Mr. and Mrs. Claus, came to me from More & More Antiques. This is the shop on NYC's UWS which is currently selling my fauna-flora-insect-themed postcards! 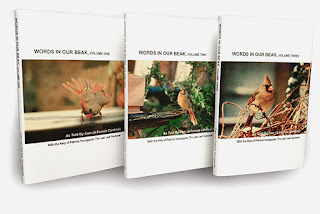 And as I've mentioned in prior posts, each of my cards has been rendered from an image that is included in the iBook and ePub version of Cam's book, Words In Our Beak, Volume One. The aforementioned postcards, as well as either version of Cam's book, Words In Our Beak, make delightful gifts for any occasion; including the upcoming holidays of Christmas, Chanukah, and Kwanzaa! But either item (or both) would be a beautiful gift to give someone who honors the beauty of nature that they are grateful for on this Second Sunday of Advent! Moreover, Cam's book, and/or the postcards created from images featured in it, would also be an appropriate gift — accompanied by a box of cookies — for those who want a unique way to celebrate National Cookie Day!